Audio Postcards Canada is here! 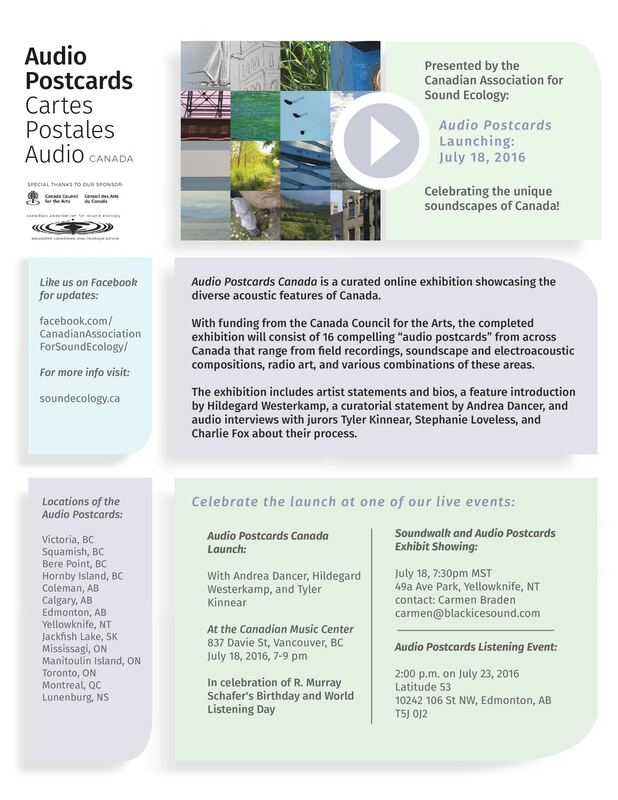 CASE is celebrating World Listening Day today with the official launch of Audio Postcards Canada, a curated online exhibition showcasing the diverse acoustic features of Canada. 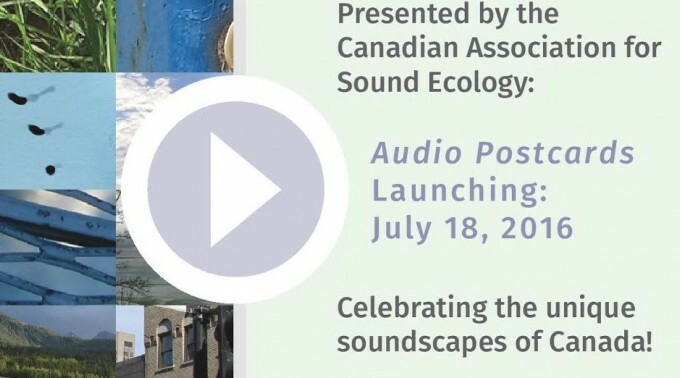 The online exhibition consists of 16 compelling 1-2 minute “audio postcards” from across Canada that range from field recordings, soundscape and electroacoustic compositions, radio art, and various combinations of these areas. Here is a podcast introduction to Audio Postcards Canada in which project lead Carmen Braden takes us through excerpts from the 16 pieces chosen for the exhibition as we listen to curators Andrea Dancer and Hildegard Westerkamp discuss the experience of putting this project together. Vancouver, BC: July 18th, 7-9 pm PDT, hosted by the Canadian Music Center, 837 Davie St. The evening will be a listening salon of the Audio Postcards Canada pieces and a discussion with Hildegard Westerkamp (Featured Contributor), Andrea Dancer (Curator) and Tyler Kinnear (Adjudicator). A Soundwalk will follow the event at 8:30. Yellowknife, NT: July 18th, 7:30 pm MDT, hosted by Carmen Braden at 49 a Ave Park. The evening will consist of a soundwalk and a showing of the Audio Postcards online exhibit. Edmonton, AB: July 23rd, 2 pm MDT, hosted by Latitude 53, 10242 106 St. NW. This will be a listening event for the Audio Postcards Exhibit. Montreal: July 20th, 9 pm – 12 am EDT at La Vitrola, as part of the Inductive Prism II event! Audio Postcards Canada Contributor, David Arango, will host with Jullian Hoff.